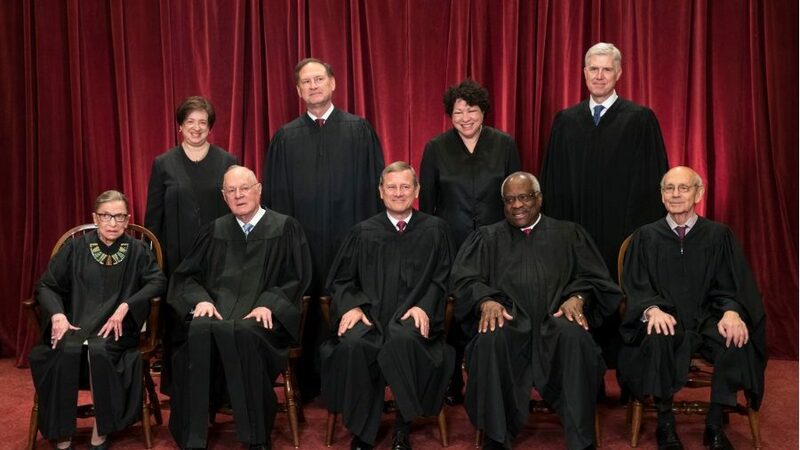 FILe - In this June 1, 2017, file photo, the justices of the U.S. Supreme Court gather for an official group portrait to include new Associate Justice Neil Gorsuch, top row, far right at the Supreme Court Building in Washington. Seated, from left are, Associate Justice Ruth Bader Ginsburg, Associate Justice Anthony M. Kennedy, Chief Justice John Roberts, Associate Justice Clarence Thomas, and Associate Justice Stephen Breyer. Standing, from left are, Associate Justice Elena Kagan, Associate Justice Samuel Alito Jr., Associate Justice Sonia Sotomayor, and Associate Justice Neil Gorsuch. The 81-year-old Kennedy said Tuesday, June 27, 2018, that he is retiring after more than 30 years on the court. On the White House website, President Donald Trump lists the jurists he is looking at to be the next Supreme Court justice. We’ve got that list, which was last updated in November, here. Looking for additional analysis? Heritage Foundation scholars provided more details on some of these names here and here.